All images © DC Comics, Inc. In 1939, the new field of super-hero comics was a hit with readers, and companies rushed to expand their character lineups. 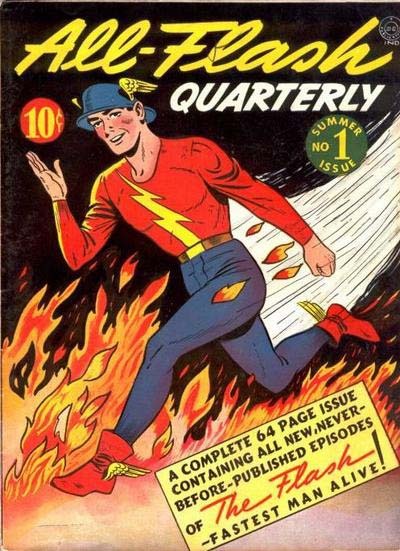 All-American Comics debuted The Flash in a new anthology title, FLASH COMICS, cover dated January 1940, but as was customary at the time, first created an “ashcan” cover cobbled together from existing but non-appropriate art. This was sent to Washington to secure the trademark for the book, the logo and the character. 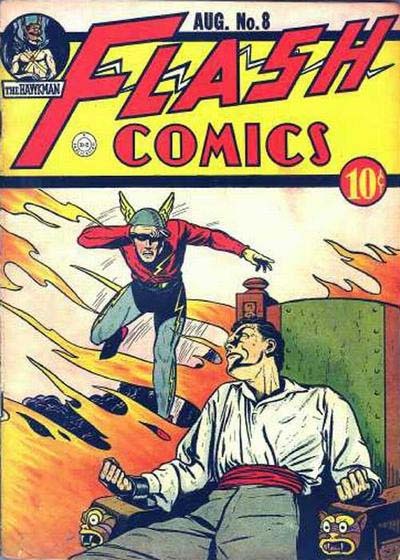 The Flash was obviously based on the Greek/Roman god Hermes/Mercury, swift messenger of the gods, with his winged helmet and winged boots, a man with super-speed, though his origin was meant to be scientific, the result of a lab experiment gone wrong. 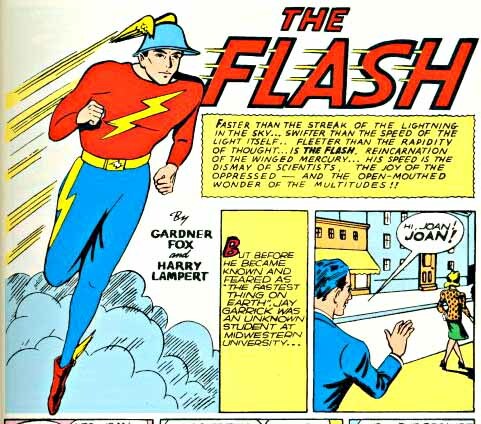 I imagine the original writer, Gardner Fox, came up with the name FLASH, though it could have been editor Sheldon Mayer. In any case, it’s a great name for a character, a comic, and a logo. First of all, it’s short and punchy, a word that sounds like what it means. And what does it mean? 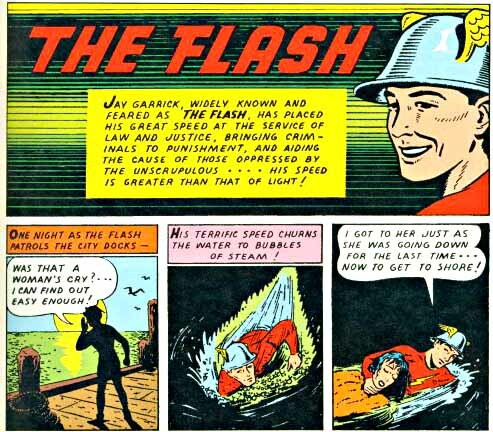 My dictionary lists 27 definitions, but most of them reflect something that happens quickly, from a flash of light to the intended meaning here, “quick as a flash.” A character with super-speed could hardly have a better name. 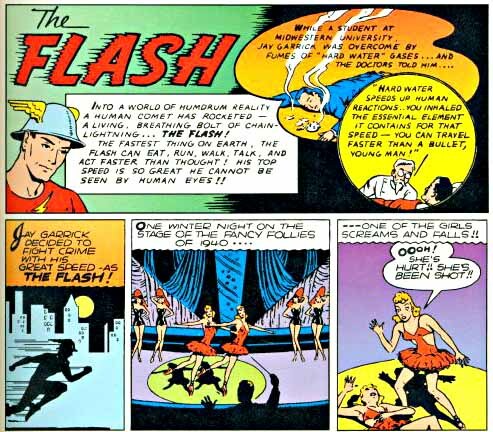 Consider the alternatives: SPEEDY sounds patronizing, WHIZ was already in use by Fawcett, WHIZZER did appear later, but all of those developed unfortunate slang meanings. SWIFT or SWIFTY, same problems. I really can’t think of anything nearly as good as THE FLASH. The logo on both covers is exactly the same, including the tagline. The letters of FLASH are very square and blocky, but they lean forward, and trail short speed lines, indicating swift motion. The drop shadow helps lift the letters off the page, and in this case, add to the feeling of movement. In front of everything is a large, attractive COMICS in script. The creator of this logo is unknown, but it gathers two key elements that have often been identified with the character throughout his history: very wide, square letters leaning forward, and speed lines. While I could pick on a few rough spots in the logo, overall it does a fine job of selling the book and the character. 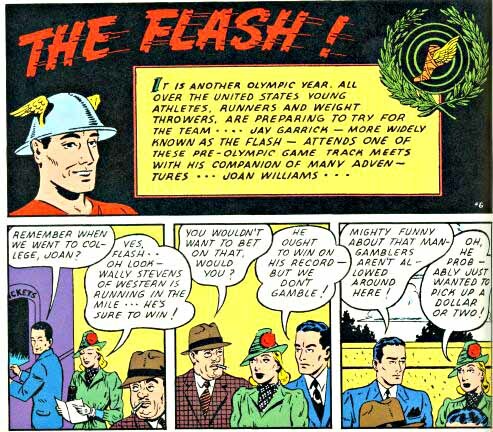 All-American was one of three early companies that merged to form what is now DC Comics. 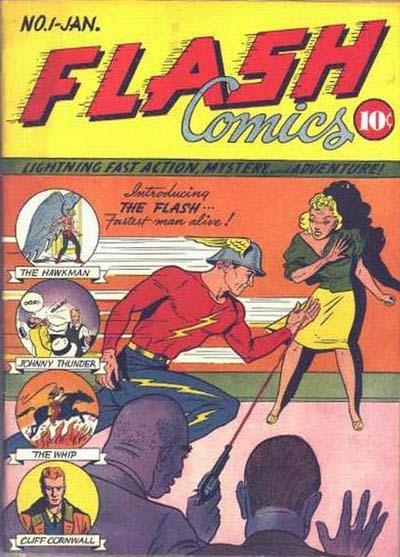 With issue 8, August 1940, a new logo and trade dress appeared, reflecting the DC brand, and using some elements from other DC books like DETECTIVE COMICS and ACTION COMICS: the broad band behind with very thick black borders, the circle with a character in it at upper left, and most importantly the word COMICS in an art deco style, which I believe was designed by DC’s early logo master, Ira Schnapp. The FLASH on this new logo might also have been designed by him, although it doesn’t quite look like his style to me. Then again, the letters are much more regular and even in weight and proportions than the first version, so maybe it was. Another important element of the logo has now been added: a very large F. And instead of speed lines, there’s now a rather crude lightning bolt behind. That part, and also the wide space between the S and the H both suggest to me things that Ira Schnapp wouldn’t have done, so I’m leaning toward the opinion that it wasn’t by him. This logo does a fine job, though, and would remain on the cover for many years. The similarity to other DC titles was an added selling point, helping to brand the line. 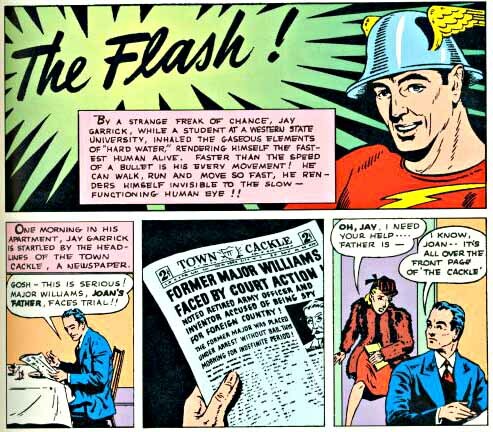 The Flash was a hit, and successful enough that, in 1941, DC launched a new title featuring, as it says, ALL-FLASH stories. The logo for this one is an attractive brush script. Doesn’t really reflect anything about the character, except that it’s leaning well forward and extended horizontally, but the design of the letters is very professional, obviously created by someone with a solid knowledge of show-card title lettering. Many logos of the time did a much poorer job. 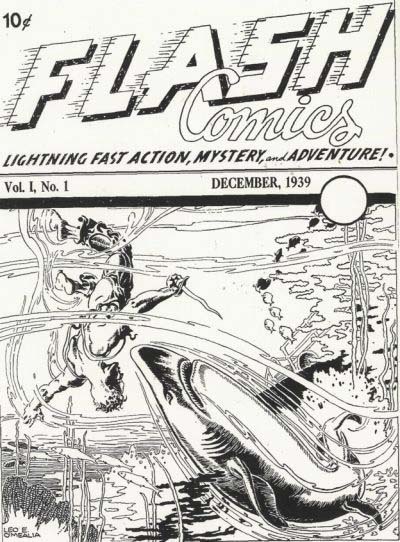 Let’s have a look at the logos used on the inside of FLASH COMICS. This one from the first issue is fairly typical of the time — probably drawn by artist Harry Lampert. The letters are fairly standard open block letters with squared ends, though here the S is curved. They lean forward, and have speed lines, as on the cover, but notice how these speed lines are in pairs, breaking the heavy borders of the letters. We’ll see that same technique used when the character and logo are revamped in the late 1950s, so it’s interesting to see it here on the very first story. As often happened at the time, the first several issues each have a new logo designed for their particular story. This one on issue 2 follows a similar idea, but these speed lines are quite different, consisting of a series of scalloped points along the entire left edge of each letter. Not as attractive to my eye, and this version didn’t appear again. On issue three we have a solid brush script style not too far from what appeared on ALL-FLASH, though more condensed. The surrounding large burst adds excitement. For issue 4 another competely different approach: well-formed block letters leaning forward against a background of speed lines. I like this version, but again it appeared only once. Issue 6 is perhaps the most unusual of the lot: the logo has speed lines going to the right, as if the logo is moving left, or backwards. Yet the letters are still leaning to the right. To my eye, the conflicting messages kind of cancel each other out, negating any motion at all. 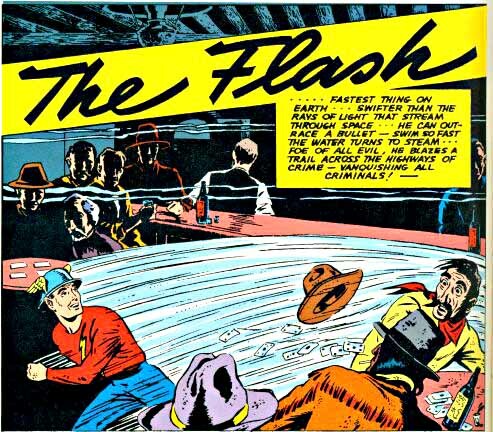 Several issues use this variation on the ALL-FLASH brush script lettering, but even more stretched out horizontally. Again, very professional looking, doesn’t say a lot about the character, but could be worse. But in those days, nothing was really planned for the story, and on issue 16, the artist E.E. Hibbard put in his own version, using the ideas we’ve already seen, but with letters having a more cartoony bounce. On a feature like this where a number of artists drew stories, each was allowed to give the logo his own style, and I kind of like that approach, actually. 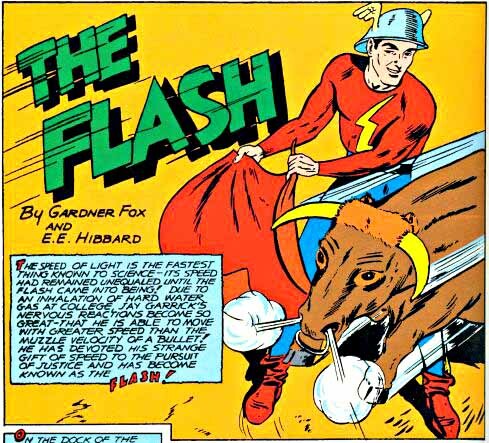 Next time we’ll look at the 1950s and 60s, when the Silver Age Flash took over! This entry was posted in Logo Studies on April 16, 2008 by Todd. Nice work! Looking forward to your thoughts on issue 18 of Wally’s run – a one-off logo apparently created to compliment Joe Kubert’s terrific illustration.